There are a lot of content creators in the Destiny 2 community, and it can be really difficult to know which ones are the ones you should be following. Of course each content creator is different, and what one person likes another may not, but we thought we’d put together the top 10 Twitch channels that you should follow so you know which ones are generally considered the best. Datto was probably one of the most prolific Destiny streamers when the first game released, and he continued streaming when Destiny 2 came out. While he doesn’t stream too much now, mainly because there’s only so much of a single game you can play, he still has a regular schedule that includes Destiny 2. He is also considered one of the biggest Destiny 2 streamers and one to get into if you’re getting into the game. LacedUpLauren is a streamer who tends to play more multiplayer in Destiny 2 than anything else. She’s a bit of a Crucible hotshot and tends to play that more than anything else. She gets involved with those who watch her on the channel, and since she’s fairly laid back you’ve got a good chance of being eased into the mental world of Destiny 2 multiplayer. Gigz likes a challenge, and his channel is where you’re going to find a massive range of them. From his Twitch page you can access a number of different videos in which he’s taken on the challenge of getting a certain number of kills, completing raids in a certain amount of time, and helping other Guardians though Guided Games. This is the place to go for intermediate Destiny 2 fans who want a little more than entry level content. xGladd is a member of clan Redeem, the ones who finished the Last Wish raid first. This is the channel you want to watch if you’re into firsts in the Destiny 2 community. The channel is a bit more niche because of how in-depth everything is, but it’s a good point to work up to through some of the smaller channels in this list. Ms5000Watts isn’t someone who mainly streams Destiny 2, but she’s funny and she’s good at it. She’s another channel to get into if you want to get into watching Destiny 2 without it being either the main focus of the channel, or too intense. TripleWRECK is like xGladd in that he’s a member of an active clan in Destiny 2 and streams it a lot. He’s another channel to watch for serious gameplay that’s got more going for it than other streamers who simply dabble in the community. He interacts with his streamers quite a lot so it’s a good place to find a home on Twitch. Luminosity is a member of BombSquadKittens, another active Destiny 2 clan. The channel is generally filled with all things Destiny 2, but when there’s nothing to go out and do in the system Luminosity chills out by playing a lot of PVP. This is probably the channel to watch if you’re after some serious Crucible gameplay. Char is a variety streamer and as such you’ll find a lot of different games on the channel. Once again this is one to go to if you’re looking for a fun community to be a part of that isn’t too Destiny 2 focused. It’s for those of you who are still getting into the world of Twitch. This channel is the one to hit if you want deep deep Destiny 2 statistics all the time. Generally Th3Jez works across both YouTube and Twitch, but on the Twitch side of things streams can consist of things such as chasing the best rolls on a weapon by getting it from Engrams as many times as possible in 6 hours. That’s what you’re looking at here. This list is in no particular order but if you follow one of these channels it should be Bungie’s. They always do streams leading up to the launch of new DLC, and they have something going on quite a lot of the time because this is one of their main points of contact with the Destiny 2 community. 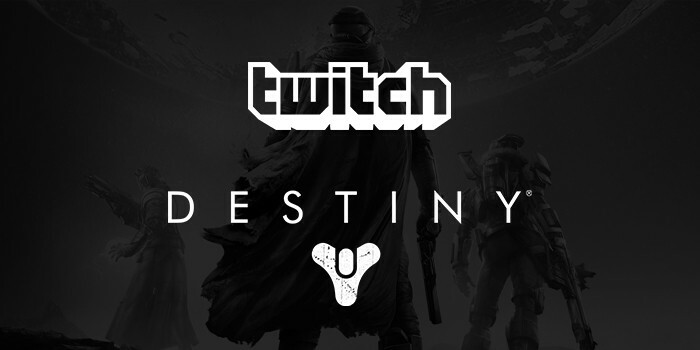 We hop that this list helps you get a better hold on the Destiny 2 Twitch streamer world. Let us know what you think of these streamers in the comments.